1.In covered, deep wide-bottomed 2- to 3-quart saucepan or skillet, heat 1-1/2 inches water to boiling over high heat. Add lobster tails; cover and heat to boiling. Reduce heat to medium and cook 4 to 5 minutes or until lobster meat turns opaque throughout. Transfer lobster to cutting board to cool slightly. 2.Meanwhile, in large nonstick skillet, melt butter over medium-high heat. Add mushrooms and shallot and cook 10 minutes or until mushrooms brown, stirring occasionally. Remove skillet from heat. Transfer mushroom mixture to bowl. Add sherry to same skillet; heat to boiling over medium-high heat; boil 1 minute. Add cream, peas, salt and cayenne; heat to boiling; boil 3 to 5 minutes or until sauce thickens slightly. Stir in mushroom mixture; heat through. Remove skillet from heat. 3.With kitchen shears, cut down 2 times along side of each tail’s underside membrane nearest to the hard shell. Gently ease meat out in 1 piece; discard membranes and reserve shells. Cut lobster meat crosswise into 1/4-inch-thick slices. Add meat to skillet with sauce and cook over medium heat 1 minute or until heated through. 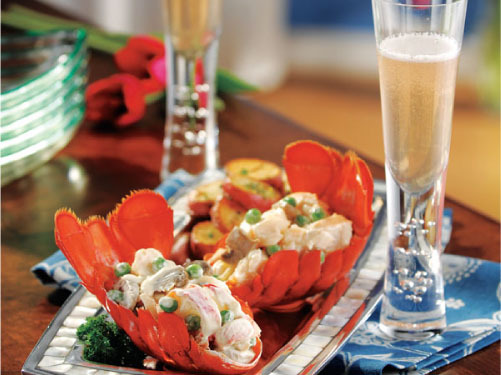 Fill shells with lobster mixture to serve.